In 1976, Mark Fidrych made his major league debut at the age of 21 and took the city of Detroit by storm in a spectacular rookie season. He started the All-Star Game for the American League, won the Rookie of the Year Award, and finished second for the Cy Young Award. Of course, Mark Fidrych’s career wound up being cut extremely short because of injuries to his pitching shoulder, and an unfortunate ending came to what could have been a fantastic career. While Les Cain’s rookie season, six years earlier, wasn’t nearly as prolific, it was nearly as good. The young left-hander had a strong first half that well could have put him on the American League All-Star team, and the media were talking about his chance to win 20 games. Then, in the second half of the season, the shoulder problems began to develop, hence the parallel to Fidrych. Just two years later Cain was out of baseball. Cain’s story is still interesting. He’s had some brushes with Hall of Famers, and he’s also done something that no other pitcher has yet done. And he took a stand against the baseball establishment, so Cain’s story, while short, goes beyond his playing days. Les Cain was born January 13, 1948, in San Luis Obispo, California, about halfway between Los Angeles and San Francisco. His family moved to El Cerrito, California, a suburb of Oakland. He required skin graft surgery on his right arm when he was 18 months old after hot grease was spilled on his arm. Cain attended El Cerrito High School and played both basketball and baseball. He was all-league in baseball as a sophomore, but broke his foot between his sophomore and junior years. This didn’t seem to affect his performance too much; on April 28, 1965, Cain had a truly spectacular performance on the mound, pitching ten innings of a 12-inning contest and striking out 20. None of his past exploits compared to what he did in 1966, his senior year, when he put the El Cerrito Gauchos on his back and carried them to the Alameda County Athletic League pennant. In one week in April, Cain threw a two-hit shutout then followed that with a no-hitter. The no-hitter pushed the Gauchos to a league-leading 7–1 record at the time. Then on May 24, he not only held the opposition to a single run in an extra inning, eight-frame game but also scored the winning marker in the Gauchos’ final game of the season. The win gave El Cerrito an 11–5 record that was good enough to win the pennant. For his efforts, Cain was the only player on his team to be named on either the first or second All-Alameda County Team; he was also the only unanimous choice of league coaches. With a 9–5 record on the mound and a .363 batting average at the plate, he was named player of the year. The team felt that Cain pitched well enough to earn a promotion for 1967 to the Double A Southern League, where he played for the Tigers’ affiliate, the Montgomery Rebels. Cain got off to a rough start and lost his first four decisions before he finally picked up a win on a six-hit shutout May 12, 1967. He fell to 6–9 in mid-July but on July 22 Cain threw a no-hitter against the Birmingham Athletics. Barry Morgan, who would never play in the majors, made a diving catch of a line drive by future Hall of Fame outfielder Reggie Jackson for the final out of the game. Cain showed some improvement in the second half of the season, finishing with an 11–13 record. He led the loop with 31 starts (he pitched twice in relief) and 104 walks, and was sixth in the league with a 2.77 ERA. Once again, he struck out his fair share of batters (133 in 185 innings) but also struggled with his control with all of the walks. Over the winter, Cain pitched for the Tigers’ Florida Instructional League team at Dunedin, which won the league crown. 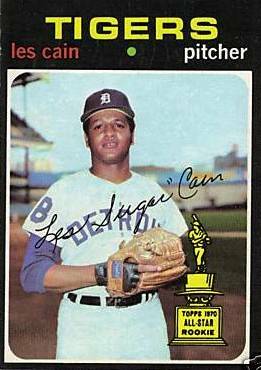 At age 20, Cain was the youngest player invited to the Tigers’ spring training camp heading into the 1968 season. While he was probably a long shot to make a team that had fallen just one game short of tying for the American League pennant the year before, Cain made an immediate impact by throwing three shutout innings in his first spring game, on March 10. He gave up just one hit and struck out two against a Minnesota Twins first-string lineup. He tossed three more shutout innings against the Washington Senators in a relief appearance on March 26. For his efforts, he joined infielder Tom Matchick and pitchers Daryl Patterson and Jon Warden as one of four rookies to make Detroit’s opening day roster. In the April 20, 1968, issue of The Sporting News, manager Mayo Smith said, “When we need a fifth starter, Cain would be the one.” Even more impressive was the fact that Cain was the youngest player to make a big league opening day roster (Gary Nolan, four months younger than Cain, supplanted him when he made his season debut that May 31, and all other players who were younger than Cain in 1968 all made their debuts during September call-ups). Cain didn’t see action until two weeks into the season when the Tigers played their doubleheader against the New York Yankees at Tiger Stadium on April 28. After a tough 2–1 Tigers loss in the first game, Cain made his first major league start in the nightcap and did as well as any first-timer could, pitching into the eighth inning and holding the Yanks scoreless through the first seven. The lone run scored against him came on a solo home run by first baseman Andy Kosco to lead off the eighth inning. Cain then left the game in that inning with the score tied 1–1. The Yanks scored another run in the eighth, but the Tigers pulled out the game with two runs in the ninth on solo homers by Bill Freehan (who caught Cain in his debut) and Jim Northrup. Cain also picked up his first career hit with a double in his first at-bat to lead off the third inning. For the next three weeks, Cain was used as a reliever. In three appearances, he held the opposition to just one unearned run in 5.2 innings. He finally got another start in a doubleheader against the Washington Senators on Sunday, May 19. This time, he didn’t waste the opportunity and with Jim Price as his backstop, threw 6.2 shutout innings and picked up his first major league win. He had problems finding the plate at times, walking six batters, but struck out eight. To cap off a busy week, Cain used a West Coast trip the following weekend to marry his high school sweetheart, Vera Nell Washington. Cain got two more starts in 1968, but neither went well. On May 28, he was pulled with one out in the third inning after giving up a run on three hits and four walks. Four days later, on June 1, he was humbled by the Yankees, who tagged him for four runs and five hits before he was taken out with just one out in the first inning. In both of those two poor starts, the Tigers came back to win the games so Cain escaped a loss. After another poor relief appearance on June 15, Cain was demoted. Whether it was to get more seasoning or to work on his control, he put together some nice numbers for the Triple A Toledo Mud Hens. Finishing out the season with Toledo, he went 7–5 with a 3.27 ERA with 76 strikeouts and 41 walks in 77 innings. More importantly, Cain got the start in the Mud Hens’ final game of the season, on September 8 against the Rochester Red Wings, with the International League pennant at stake. Cain not only held the Red Wings to three hits in a shutout win, but he also starred on offense with a grand slam home run and six RBI in the 17–0 victory. The winter of 1968 and the 1969 season were setbacks for Cain with one exception. He played winter ball in the Puerto Rican Winter League for the Mayaguez Indians, and after struggling with a 2–6 record to start the season, he pitched a no-hitter on December 3, 1968. It was only the eleventh no-hitter in the league’s history. Cain found himself once again playing for the Mud Hens in 1969, but this time there was no pennant or happy ending to the season. He struggled most of the season, walking almost as many batters (71) as he struck out (79). He finished the season just 4–12 with a disappointing 5.71 ERA. Things worked out better for Cain in 1970, though, and despite finding himself back in Toledo to start the season, he put together three impressive starts in which he gave up just four runs in 25 innings. His performance was good enough to warrant another look by the Tigers, who brought him back after Daryl Patterson was called to serve a few weeks of active Army duty. Cain’s first Detroit start of 1970 didn’t go well. Although he struck out nine batters in just five innings, the Chicago White Sox tagged him for six runs in a 13–6 loss on May 1. But he followed with his first major-league complete game and second career win with a solid start on May 6, defeating the Minnesota Twins, 5–2, with a seven-hitter, though he walked six. In his third start, on May 12, he was back in the loss column despite giving up just three runs in seven innings of a 7–2 loss to the Chicago White Sox. The second half of 1970 didn’t go nearly as well for Cain and it was later revealed that he was pitching with a shoulder injury that forced him to miss the last two weeks of the season. He did finish the season with 156 strikeouts, a Tigers rookie record that still stands. He did show his propensity to miss the plate with 98 walks, but his 12–7 record and 3.83 ERA were certainly respectable. His 7.77 strikeouts per nine innings were good for third-best in the American League. Only Cleveland’s Sam McDowell and Kansas City Royals rookie Bob Johnson had higher marks among starters. On September 12, 1971, Cain threw 3.2 unspectacular innings in a start against the Red Sox. One run came on a home run by Red Sox catcher Carlton Fisk, the first hit of what would be 2,356 in his Hall of Fame career. Cain finished strong in September, winning his last three decisions to put his record at 10–9. He once again showed he could strike batters out with 118 whiffs in 144.2 innings, but he was also handing out lots of free passes, with 91 during the season. On November 14, 1971, Cain became the first person ever to throw two no-hitters in the Puerto Rican Winter League with a 1–0 victory for the Mayaguez Indians. The three no-hitters as a professional, plus his fourth when he was in high school, had to have been the greatest moments of Cain’s baseball life. Cain’s career came to an abrupt end in 1972. After nursing the shoulder injury in his previous two years, he got off to a horrible start, losing his first three starts of the season. Then in his fifth start of the season, on May 28, Cain walked the first batter he faced, the Yankees’ Horace Clarke, and then was forced to leave the game because of shoulder pain. He went on the 21-day disabled list, and it turned out to be the end of Cain’s major-league baseball career. Cain almost got one last shot July 8. Tigers reliever John Hiller told the story in the Detroit News in 2005. Hiller was himself coming back from his three heart attacks and intestinal bypass surgery the year before, and Cain was trying to come back from his shoulder injury. As Hiller recalled it, Tigers manager Billy Martin told both Cain and Hiller, “Warm up. I’ll keep one of you and release the other.” Hiller apparently made more of an impact that day, and went on to be the greatest relief pitcher in Detroit Tigers history. Cain was eventually sold to the San Francisco Giants organization. With the Phoenix Giants, Cain struggled in two starts and three relief appearances, giving up nine runs in just 11 innings. Those outings with Phoenix were his last in professional baseball. He was invited to spring training by the Giants in 1974, but he failed to make the team. Les Cain’s story doesn’t end with his baseball career, though. While players like Curt Flood took on the reserve clause and Andy Messersmith, Dave McNally, and Catfish Hunter paved the way for free agency, Cain took a stand in a different way. With his baseball career over, he filed a disability claim against the Detroit Tigers in 1973 with the Michigan Bureau of Workman’s Compensation. He said he was effectively forced to play through the injury. Though Cain was employed when he filed the claim—he was in California working for Bank of America in Oakland—he was unable to play baseball. Les Cain, recently widowed, currently resides in Richmond, California, and he has one son, Brian Earl Cain Sr., and one grandson, Brian Earl Cain Jr. Brian Jr. currently lives with his mother. Although he isn’t following in his grandfather’s footsteps as a baseball player, he’s become one of the top prep soccer goalies in the state of California and an honors student at his high school in Citrus Heights. “Cain Goes Distance for Tigers In Beating Twins.” Ironwood Daily News, May 7, 1970. “Cain Sparks Gauchos.” Oakland Tribune, May 25, 1966. “Compensation for Les Cain Landmark Case.” Oakland Tribune, February 8, 1977. “El Cerrito Pitcher Fans 20.” Oakland Tribune, April 28, 1965. Fox, Bill. “Cain Able; Hens Win Pennant on Final Day.” The Sporting News, September 21, 1968. Frau, Miguel. “Cain Reverses Skid—Hurls No-Hit Gem” The Sporting News, December 21, 1968. Frau, Miguel. “Mayaguez’ Cain Uncorks Second P.R. No-Hitter.” The Sporting News, November 27, 1971. “Gauchos’ Cain Fires No-Hitter.” Oakland Tribune, April 23, 1966. Paladino, Larry. “Campbell Very ‘Scotch’ as Detroit Tigers GM.” Benton Harbor-St. Joseph Herald-Palladium, January 29, 1977. Spoelstra, Watson. “Horton Hitting Gives Tiger Foes Case of Willies.” The Sporting News, June 1, 1968. Spoelstra, Watson. “Pitcher Lolich Fielding Red-Hot Queries In Public Speaking Loop. The Sporting News, December 3, 1966. Spoelstra, Watson. “Tiger Puzzler: Can Lolich Fill Hill-Ace Shoes?” The Sporting News, February 27, 1971. “Two More Eastbay Preps Draft Picks.” Oakland Tribune, June 9, 1966. “Two Vikings, One Pirate Named to All-County Nine.” Hayward Daily Review, June 7, 1966. Watson, Michael. “Richmond Choice In ACAL.” Hayward Daily Review, March 16, 1965. Les Cain file, National Baseball Hall of Fame Library.